Having done a lot of ARF and bolted my own routes I am always looking for ways to improve all things climbing. I think it is a great system as you don't untie. They are not that expensive either. Last edited by Brussel on Fri Jun 15, 2018 9:40 am, edited 1 time in total. Last edited by NatureBoi on Fri Jun 15, 2018 1:00 pm, edited 1 time in total. The pig tail lower off's are great - are they easy to replace (looks like you can muscle them through)? Obviously they will wear faster (than a ring). The rings are great, yes you need to untie, but all climbers should know how to do this. The carabiner is great, but they wear fast. CityROCK sponsored the quick links that I put up at the Steeple. IMO they have lasted long (6 years), but they are becoming quite worn and I need to go an inspect them soon. Having (expensive) quicklinks at the top of routes is awesome. But to keep it manageable, climbers need to contribute towards the purchasing. 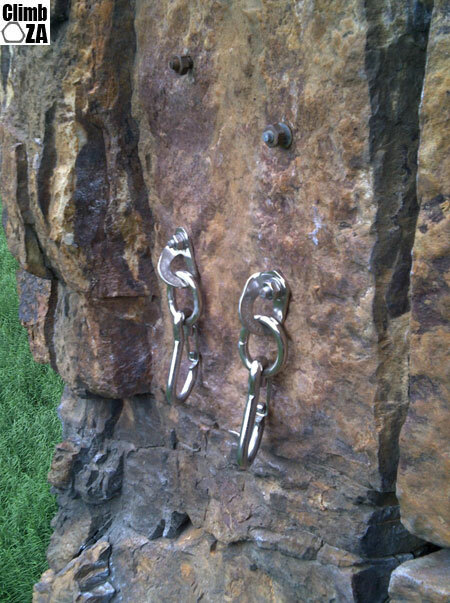 If everyone forgoes R100 (lets say there are 300 regular sport climbers in the cape - that's R30'000 to spend on top anchors). It works well if everyone contributes. The great thing about all of your choices is that the entire anchor is made from the same metal as the bolt (which will combat corrosion in the long term). Justin, why have you placed them with the gates facing the rock? I cant think of why this would be any safer, just more awkward to clip. Regarding the gate, I'm not crazy about anything that can move/ pivot, I used similar where the the gate had corroded slightly and made clipping troublesome. Although those displayed are AISI 316L material, so corrosion would be a lot slower. Regarding the ''Europe'' Anchors shown above- I don't think they make them to suite glue-ins. The rope will also run on/in the same point so wear will be accelerated. This is where double rings are great as they each move independently. I'm also not a fan of single rings (for mechanical expansion bolts). The single ring can bind to the edge of the hanger or can be trapped by contact/ friction with the rock-thus not rendering movement and cause wear in a single spot. Last edited by NatureBoi on Fri Jun 15, 2018 1:19 pm, edited 3 times in total. Not necessarily so, It has 4 wear points on Ø10mm round bar. 1) I have sourced material. 3) My one concern is getting them tested by CSIR/ SABS to negate any liability. 4) If we get a large enough batch made it will drop the price per unit. Wes wrote: Justin, why have you placed them with the gates facing the rock? I cant think of why this would be any safer, just more awkward to clip. That was the configuration of how the lower offs came. I assume that somebody made a mistake during the manufacturing process!? Are sport routes worth investing in? Who should the investors be?